Most Curling Clubs do not have a timing solution for their tournaments or competitive leagues... not because they do not see a need, but rather due to the prohibitive costs of the hardware. 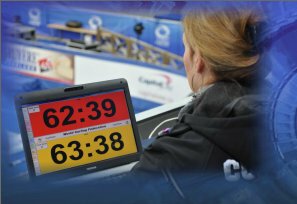 Specialized timing clocks can cost thousands of dollars and considering that most clubs operate on a shoestring budget, that sort of purchase is rarely, if ever, considered. Not only that, the operation of the clocks most often uses a proprietary system that can take quite a while to learn. CurlTime is designed to be affordable and easy to learn. It runs on any computer that has a Windows XP, Vista or Windows 7 operating system, which nowadays are familiar environments for most people. It has been designed to be simple to learn and simple to use yet it has several configurable options so that it can be customized to meet many needs. Select the "Features" button above to see screenshots and a brief explanation of its operation and equipment setup.